2014 was a banner year for the RCSB PDB. We celebrated the International Year of Crystallography, and released the 100,000th structure in the PDB archive. The new wwPDB Deposition and Annotation system went into production, and processed thousands of entries. Large and complex structures, historically split across several entries, were reunited into single files. Along with a new redesigned look, rcsb.org added many powerful tools that enable research and education. The new year brings yet another milestone: the 15th anniversary of the Molecule of the Month column. The column was launched in January 2000 with a feature on myoglobin, the first structure determined using X-ray crystallography. Since then, 180 Molecule of the Month articles have explored the structure and function of PDB macromolecules from AAA+ proteases to Zinc fingers. These articles are one of the most popular features of the RCSB PDB website and are utilized by classrooms around the world. 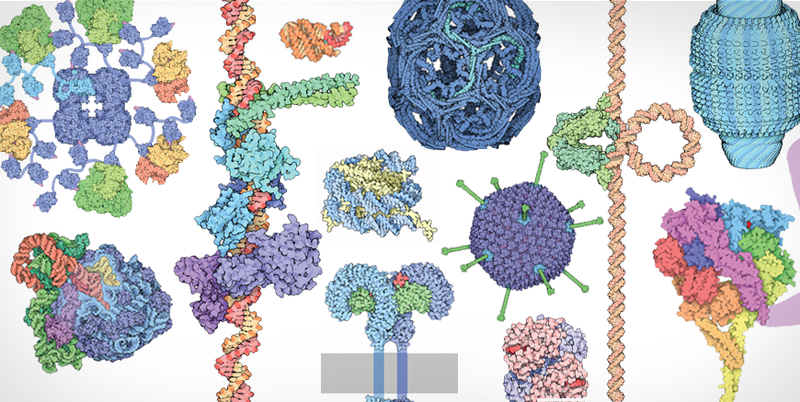 Authored and illustrated by David S. Goodsell, Molecule of the Month features have grown to include curated, interactive views, discussion topics, and links to specific examples. The carefully composed illustrations, available free for use as high resolution images, have been reproduced and used in countless educational resources. These unique pictures of molecular machines provided both inspiration and content for the Art of Science traveling exhibit. Through the years, Molecule of the Month features have become tightly integrated with other RCSB PDB initiatives. Many posters, paper models, and animations have been built using these features. The articles have also led to the creation of the Structural View of Biology browser, which offers top-down contextual exploration of the PDB. January's focus on Cascade and CRISPR will be used in this year's protein modeling event in the Science Olympiad. 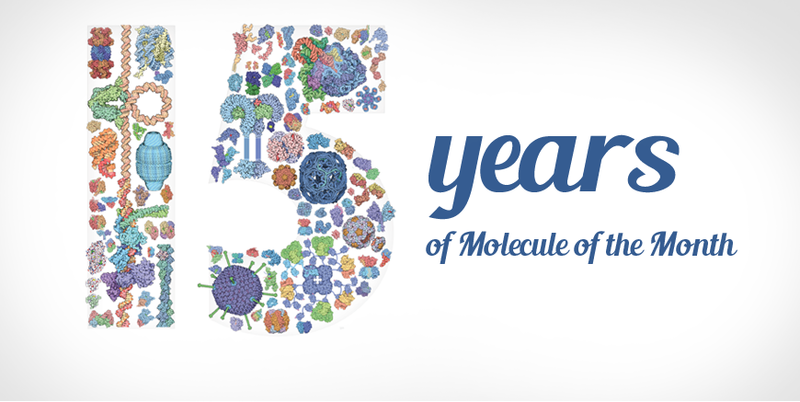 To celebrate this special anniversary, we have assembled an online PDF calendar for 2015 that features a small selection of the many molecular highlights of the past 15 years. 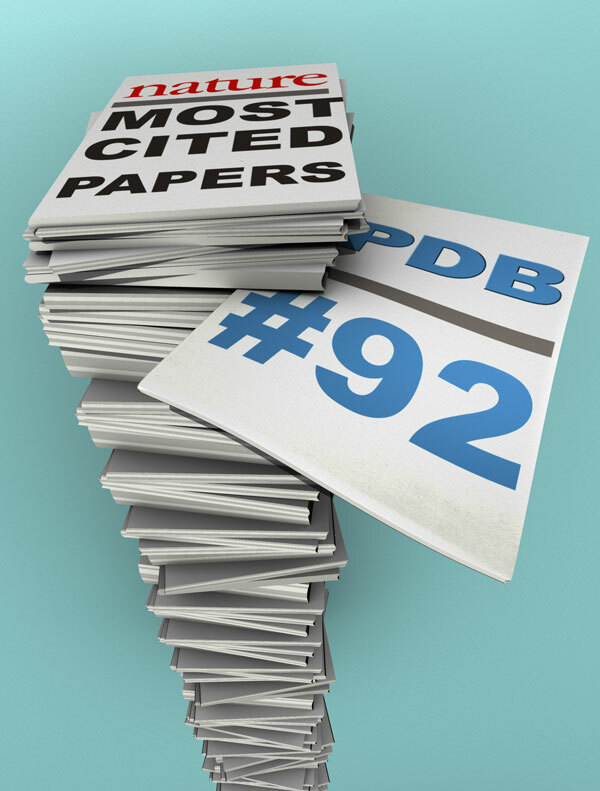 January 2015 also marks the 15th anniversary of the publication of the RCSB PDB's main reference in Nucleic Acids Research, which made Nature's list of the 100 most-cited papers.